This is a zoom lens manufactured by Canon and the model was launched 2007. The lens has a focal length of 18-55 mm. Since the lens is designed to be used on a camera with smaller sensor ('APS-C') the focal length will be equivalent to 29-88 mm on your Canon camera. One thing to consider is that the lens has a variable brightness, which means that depending on how much you are zooming the lens will have a different maximum aperture value. At 18 mm the lens brightness is f/3,5 and at 55 mm the brightness is f/5,6. Through the link below you can read more about what this could mean for you as a photographer. 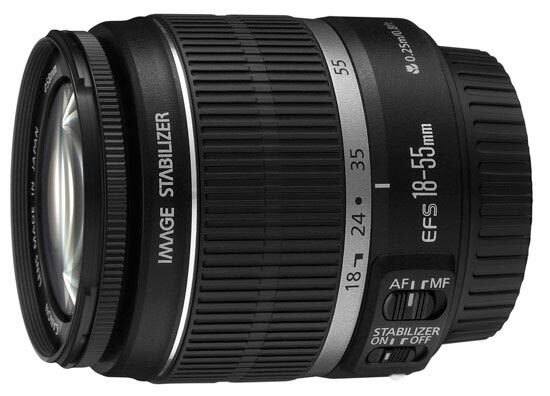 Text from Canon: "The “EF-S18-55mm F3.5-5.6 IS” is a standard zoom lens with a very small Image Stabilization (IS) unit. Image stabilization reduces blur due to camera shake by the equivalent of about four shutter-speed steps*, while maintaining excellent cost effectiveness. The inclusion of a precision aspherical element in the design provides excellent aberration correction, particularly of spherical aberrations, and ensures excellent image quality at all focal lengths. The closest focusing distance is 0.25m at all focal lengths, and the zoom-ring pattern and coating used on our high-end models is used resulting in a firmer grip and a high-grade exterior finish.